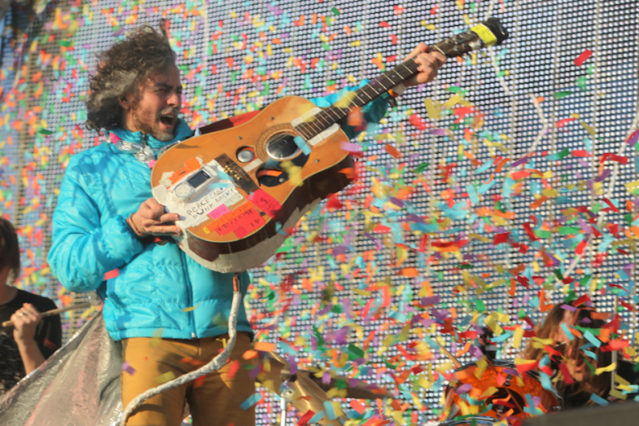 Because there are very few, if any, ways to top the weirdness factor of selling your collaborators’ blood, the Flaming Lips have announced that they will be pulling a Jack White and taking on a Guinness World Record currently held by Jay-Z. During MTV’s upcoming O Music Awards, Wayne Coyne and Co. will attempt to play Most Live Concerts In 24 Hours. And yes, you read that correctly: The O Music Awards will be 24 hours, putting an end to any jokes about the interminable length of the Oscars. The Lips won’t be the only ones on the bus either — everyone involved in the ceremony will be tagging along, too, marking what organizers are claiming as “the world’s first live 24-hour moving awards show.” The show, which was started last year as a means to “celebrate and honor the artists, fans and innovators impacting digital music culture,” features fan-polled categories like Must-Follow Artist on Twitter, Most Adorable Viral Star (hint: Bone Pugz ‘n Harmony), and Digital Genius Award (for which the Lips are nominated), all of which are currently open for voting on the O Music Awards’ website. Record-breaking attempts are becoming an annual endeavor for the O Music Awards. For last year’s inaugural event, they hosted Chiddy Bang’s nine-hour vie (and win) for Longest Freestyle Rap and Longest Marathon Rapping. For the second ceremony, which took place only six months later, they put up a group of dancers who broke a record for Longest Team Dance Marathon. Luckily, however, the latter iteration was a fundraiser and collected $32,000 for anti-bullying non-profits. No word yet as to whether the Lips’ eight shows will do the same.